Be the first to share your favorite memory, photo or story of Eugene. This memorial page is dedicated for family, friends and future generations to celebrate the life of their loved one. 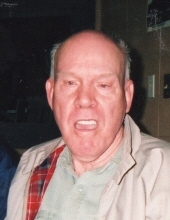 Pocahontas- Eugene Brooks, 87, passed away on February 7, 2019 at Randolph Home in Pocahontas. Eugene was born on May 24, 1931 in Dalton, AR to Charley and Notra McCandless Brooks. He was preceded in death by his parents, and 2 brothers, Bill and Willard Brooks. He is survived by his sister, Verna Poole of Pocahontas; brother, Bobby (Ginger) Brooks of Pocahontas; special sisters-in-law, Mignon Brooks and Linda Brooks; special cousins, Jerry and Sue McCandless. Visitation will be on Tuesday, February 12, 2019 from 1-2 pm at McNabb Funeral Home with a funeral immediately following at 2 pm with Terry Miller officiating. Burial will follow in Randolph Memorial Gardens. Pallbearers: Craig Brooks, Jerry McCandless, Lee Brown, Danny McCandless, Terry Ungerank, and Bryan Brooks. "Email Address" would like to share the life celebration of Eugene Brooks - McNabb Funeral Home. Click on the "link" to go to share a favorite memory or leave a condolence message for the family.